The Qubino Flush RGBW Dimmer is designed to control your RGB or RGBW LED strips in order to create countless color options. It includes 6 special lighting effects that can be used if your hub allows for enhanced parameters. The device works using z-wave technology and due to its small footprint can be installed virtually anywhere. A Z-Wave gateway hub will be required for your setup and is sold separately. If you haven't purchased a hub and you plan on using the Qubino flush RGBW make sure to read the hubs documentation as it is not supported by all hubs. 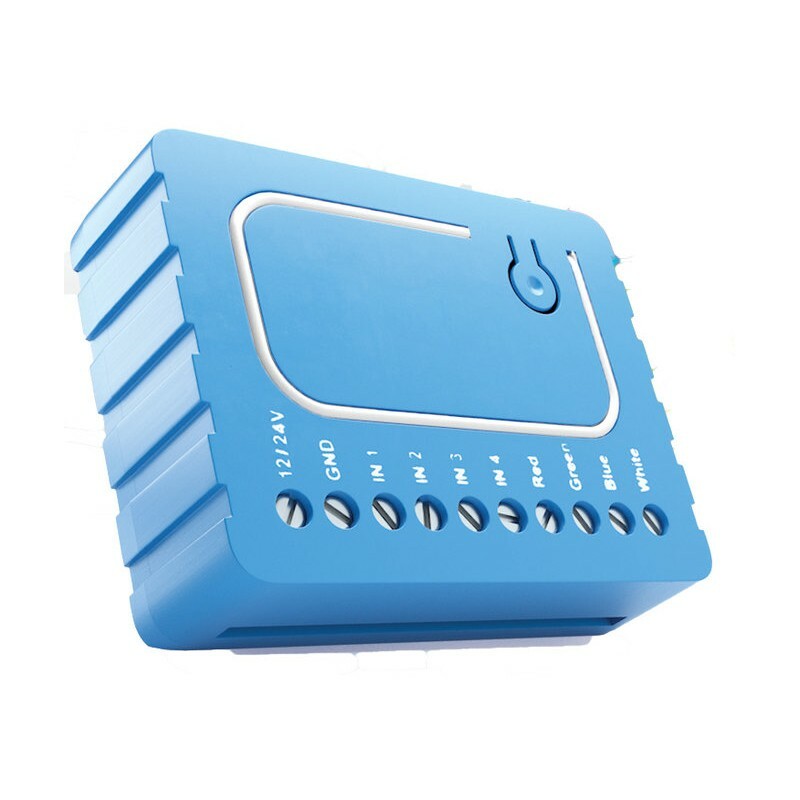 The switch is signal repeater, so it will improve your z wave mesh network. The Minimum and maximum dimming levels can be set via parameters. You can also customize the ramp rate, this allow you to change how quickly the lights turn on or off. Four push buttons allow for control of brightness, color, turning on or off lighting effects, and finally allow you to turn off the white output on its own. The dimmer switch saves and restores last status on power failure. Extra parameters allow you to put a timer in the event that you want to automatically turn the lights on or off after a set time. Note that this is just a timer and not a real time clock. If you would like to turn the device on our off at a specific time you can do so with a scene on your hub. As of this review the Vera Hub does not support the device officially and the only plugin available is not very stable (Vera Firmware version tried: 1.7.3501 with the "RGB Controller" plugin Version:1.34). OpenHab also allows you to install the device however we were not able to operate it successfully even using the latest snapshot release (openHAB 2.3.0 Build #1189). The installation of the device is extremely simple and can easily be done following the instructions on the Qubino page. Note this device will not work with 120 Volts AC but instead works with 12 or 24 Volts DC. You can control the flush RGBW either remotely through your Hubs graphical web interface, phone app, or through wall switches if wired directly to one. Overall we were pleased with the product and the response with the smartthings hub. The device currently sells for $53.00. It is packaged in a tiny plastic shell that fits virtually anywhere. We weren't happy that it didn't work with Vera or OpenHab. View the installation process and see it in action with a smart things hub in the full Video Review. It is important to note that this device will only work with standard RGB strips and not addressable strips. In short this means that all your LED's will be one color at any given time. You will not be able to make the first five led's one color and the next five a different color. Copyright © 2008 UrbanLime. All rights reserved. We care about your privacy, which is why we created these handy terms and conditions.